There's nothing like an annual tune-up to keep things in tip-top condition. For example, experts advise changing the batteries in your smoke detector every fall when daylight savings time ends, anticipating the winter season of shorter days, heating systems and Christmas tree lights and candles. That makes sense. For photographers, it makes sense that now is the perfect time for an annual tune-up of your camera gear. 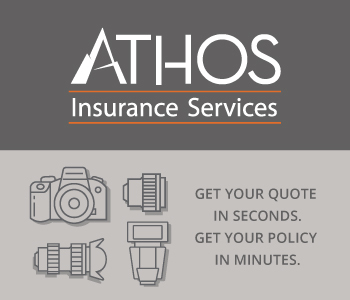 Summer is just around the bend, so this is the perfect time to perform your annual camera tune-up. Let's look at the simple steps you can take right now to guarantee that you'll be ready for the coming summer of great photo opportunities. Whether you're planning a trip to some scenic location, or simply planning a backyard party for the Fourth of July, you'll want to have your camera ready to record your adventures. Rechargeable batteries for digital cameras eventually lose the ability to hold their charge. For this reason, you will need to replace them every few years. Consider buying a second battery for your camera so you can stay ahead of the game and always have a fresh battery at the ready to replace the one you are using in your camera. Professionals always carry spare batteries for their gear. If you are taking a longer trip, don't forget your charger. There are even car chargers that work in most rental vehicles for long road trips. Particularly if you have plans for a summer vacation, family reunion, or other big event in the coming months, it makes sense to stock up on memory cards ahead of time. Don't wait to buy them at airports or expensive tourist stores — if you do that, you'll pay much more than you would from a photo specialty store or online vendor. The price of storage continues to drop, so if you've been eyeing a bigger card, perhaps it's time to splurge and get that added capacity — those 4 GB cards and even the 16 gigabyte goliaths seem to be getting more affordable with every passing day. In today's world of electronic auto-everything cameras, we recommend only minimal cleaning, which we'll cover shortly. The most important thing is to try to avoid the need to clean in the first place. Try to keep your camera away from the elements that cause the most harm: dirt, dust, sandy grit, and saltwater spray are the mortal enemies of most types of cameras. Keep your camera protected if you're on a windy beach and the sand is flying. Don't get too near those big waves to take the picture of your nephew frolicking in the surf. Use your zoom lens instead. 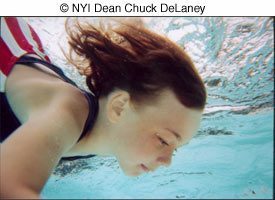 If you want to take pictures in the surf, or poolside, or even underwater, check out some of the the waterproof solutions made by Aquapac. The one part of your camera's exterior that you must keep clean is the lens. Dust and fingerprints will compromise the optical efficiency of your lens. That brings us to the most important subject related to cleaning your camera — before you clean your camera or any other photo equipment you own, remember one thing: Keep it simple. I've heard too many stories about people damaging their cameras by doing too aggressive a cleaning job. 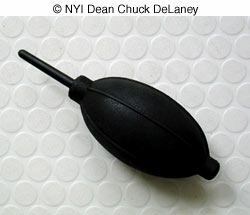 For most cleaning chores, I suggest you use just two tools — a micro fiber cleaning cloth and a rubber squeeze bulb. Let's review how each of these is used. Micro Fiber weaving is a relatively new invention. The extremely fine fibers and very tight weave of this cloth makes it possible to remove dust, grit, and even the oil left by fingerprints without the use of any solvent. These cloths are not expensive, and they can be washed and reused, so the initial investment of a few dollars is well worth it. I use the micro fiber cloth to give a general cleaning to the camera body and the front of the outer lens element. If you have a really stubborn fingerprint to remove, you can breathe very gently on the lens to let a little moisture from your breath condense on the lens, and then wipe it with the cloth. 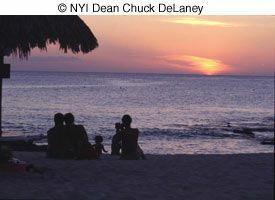 With digital cameras you have to be careful not to get dust on the sensor. Every time you change lenses you expose the interior of the camera to the outside environment. 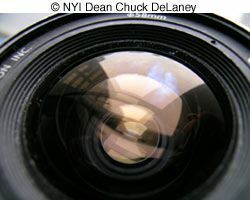 Many users habitually point the camera down when changing lenses in the hope that such a position will minimize the chances of dust blowing into the interior. But what's the big deal? You can just use one of those sensor cleaning brushes or a blower (better not use canned air for the latter; the propellant might get on the sensor) and the problem is gone. Or is it? How serious a problem is sensor dust? Well, if you often shoot at wide apertures you may not even see it. Also, it's more likely to be noticeable in areas of uniform density on the image, like clear sky, rather where you have lots of busy detail. Dust specs will likely be more visible on large prints. If you mostly make 4 x 6 inch prints, you can probably forget about it. Finally, the dust specs can be easily spotted out in Photoshop or other image editor but keep in mind those specs will be on every single frame as long as the dust is there. Sensor dust (the dust is not on the sensor itself but rather on a filter in front of the sensor) is a fact of life when using a DSLR. Most manufacturers have developed technology to deal with this with technology that shakes off the dust. If you think you have a problem with dust on the sensor we recommend sending it to the manufacturer for cleaning. There are tools to do this yourself, but be careful not to damage anything or you will void the warranty. Don't touch the shutter blades! Film cameras present another story. 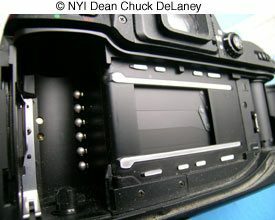 You need to keep the internal chamber where you load the film clean and free of dirt and grit that can scratch your film and negatives. However, anytime you open your film camera, heed this important warning: Be extremely cautious and avoid touching the metal shutter inside any modern auto-exposure camera. Clean the dust from the inside of your camera using a blower, but be careful to avoid the shutter blades that you see in the center of this photograph. To make faster shutter speeds and higher flash synchronization speeds possible, today's automatic cameras (particularly SLRs — single lens reflex models) feature a set of very thin metal shutter blades that replace the more durable cloth or metal shutter cover of yesteryear. These thin metal shutter blades are very fragile, and even a gentle jab or tap can knock them out of position. Any damage to these shutter blades will result in a very expensive repair job. How expensive? You don't want to know — figure $200. And up! So, DO NOT touch the shutter mechanism on your automatic camera. If it needs any kind of cleaning (and there's little reason it should) take your camera to a professional repair shop that is authorized by the camera's manufacturer. It will cost you a lot less to get the camera cleaned and checked than it would to have the shutter repaired if you attempt the job yourself and botch it. Use the blower to clean your camera's inner chamber. As long as you exercise caution and avoid the shutter mechanism, you can use your blower to remove dust from inside the camera as long as you don't touch the shutter blades or blow air directly on them. It's a good idea to clean any dust from the area where the film cartridge sits, and along the areas where the camera back closes on the body. Avoid "canned" air for camera cleaning. The reason I recommend a rubber bulb blower to blow dust and grit out of the inside of the camera body is that when squeezed, it provides a concentrated "puff" of air, but not the overly powerful "gush" that most brands of canned air supply. At NYI, we avoid canned compressed or propelled air, regardless of whatever type of propellant is used because the burst of air can be too strong, particularly for today's delicate electronic camera systems. In addition, some types of canned air use a propellant that — if you tilt the can downward — shoots out a burst of solid, frozen stuff. Who needs that in your camera or on your lens? Why do I use a separate cloth and squeeze bulb instead of the little squeeze blowers sold in camera stores that have a little brush on the bottom? Because I find those little blower/brush jobs are useless — the bulb is too little to give a good puff of air, and the brush is too flimsy to get the job done. 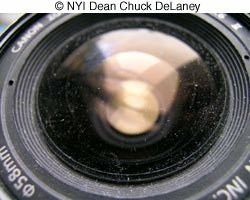 If you need to clean a DSLR lens, I suggest you start by using the blower first to blow all loose dust or grit off both the exposed face of the front lens element and the exposed face of the back lens element if it's easy to reach. 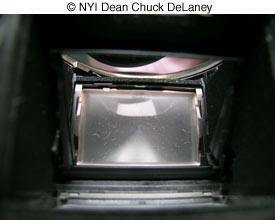 There should be no way for dust or dirt to enter the lens barrel and affect the internal elements of the lens. Then use your micro fiber cloth to finish the job. I use the same combination for glass and plastic filters as well. Lots of photographers don't bother to clean their filters, which is a big mistake since they're more likely to get covered with fingerprints than the camera's lens. One difference between pros and photo hobbyists is that pros keep their cameras in bags. A bag is likely to provide much better protection for your camera and other equipment than if you keep your camera loose in your suitcase, handbag, or briefcase. There are lots of soft and compact bags you can use to protect your camera. If you do keep your camera in a bag, and if there's room, there's one other very inexpensive accessory I recommend — a plastic bag that's big enough to hold your camera, extra camera memory cards, and any other accessories. I find this plastic bag is very handy when I encounter a sudden summer thunderstorm or find myself on a speed boat that can catch a wave or spray of its own wake. I just open the bag and pop my entire camera bag into it. Believe me, it has come in handy more than once.